4.3 out of 5 based on 107 bloggers and 15 commenters. 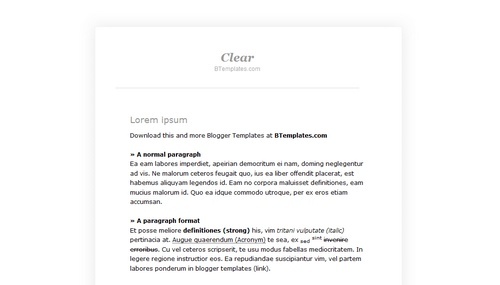 Clear is a free blogger template adapted from WordPress with 1 column, minimalist and neutral colors. love this template, keep it up guys. hi I downloaded this but cannot upload it to my blog. I saved it and the type is “Compressed (zipped) folder”. It says on the instructions that I have to “ensure you have extracted the XML theme.” how do I do that? Thanks. You need to download a software like Winzip, Winrar or Izarc (search in Google). To the creator of this template. You are AMAZING! Thanks for this clean blog template, it is what exactly i am looking for. My blog is hosted by blogger and according to blogspot user agreement, it is not allowed to remove the top nav bar (blogspot bar). I do not want my blog to be removed or banned by blogger. Can you help me in this issue. How can i bring that bar back? @Eser: Removing the Blogger navbar it is not forbidden. So, your blog will not removed if it’s not visible. Nevertheless, you can bring it back easily by following the instructions provided in our FAQ. Your template could not be parsed as it is not well-formed. Please make sure all XML elements are closed properly. XML error message: The element type “body” must be terminated by the matching end-tag “”. @Rano You can find the answer to your questions and more in our FAQ section. there is an easy way, just click on the zip folder, click folders inside until you find an icon of a white paper, with 4 black lines, and a blue green earth, copy that to your desktop, and then upload that from your blogger. This theme has a bug, install the theme after stretching the width of the browser, when reduced to a certain width, background image dislocation, the top and bottom of the background and not on the middle background, greatly affected the appearance. Love this template, but the ‘Powered By Blogger’ is in a really odd place and goes off the column. How can I change this? Hi, I love this theme, but for some reason the ‘Powered By Blogger’ is in a really odd place. It goes off the column. How can I fix this?